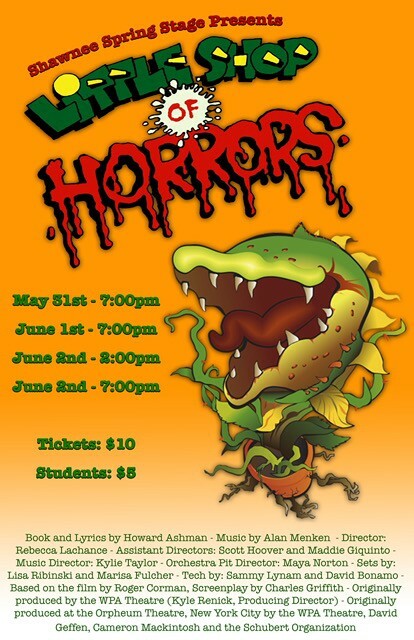 “Little Shop of Horrors” will be presented on May 31, June 1 and June 2. This year, the students of Shawnee High School’s Spring Stage Club are proud to present “Little Shop of Horrors”, a show with catchy tunes and comedic drama. The Spring Stage is a production that is organized, directed, choreographed, and promoted by the students. It provides an opportunity for Shawnee students to learn all aspects of creating a show with the guidance from an advisor when needed. The musical will take place at the Shawnee Auditorium on Thursday, May 31, Friday, June 1, and Saturday June 2, at 7 p.m. An additional performance will take place on Saturday, June 2nd at 2 p.m. Tickets, available for purchase at the door, are $10 for adults and $5 for students.